at Wallingford Lutheran Church in Wallingford. 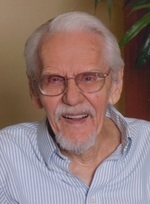 Virgil died Dec. 13, 2018, at the Good Samaritan Society in Estherville. Visitation will be held from 2-3 p.m. at the church in Wallingford. Private family burial will be held at a later time. color of the day is white! Please be there about 2:30 to vest and gather.